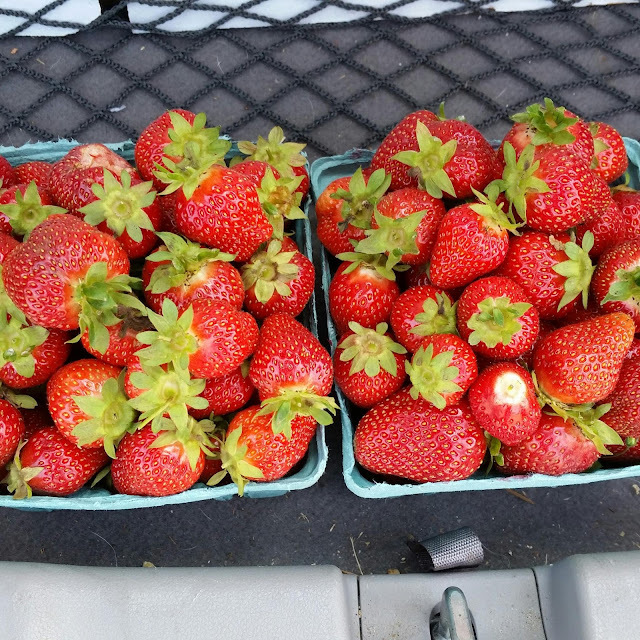 Turns out the Pick Your Own at Honey Brook Organic Farm runs Monday to Sunday. Which means that day we picked our strawberries...Week .5....really was a week we should have received a box. Yet, we didn't and the people picking up their boxes at the farm did. Let me tell you a story. I have to smoosh around my dog's wet food and then mix in his dry food. I also have to smoosh around my cat's wet food for no real reason, other than she will absolutely not eat it if I don't. Why? Because she wants the same treatment as our dog, and I don't blame her. So far this is my biggest complaint about Honey Brook, the inconsistencies in shares. The people picking up at the farm pay less and get more. How would you feel if Costco said, all local customers get 25% off of everything, but if you live out of town, you have to pay full price? You'd be annoyed and take your business elsewhere. Additionally, on Monday, they said Premium Box Share members get 3 quarts of strawberries, Friday they changed it to 2 and then Sunday, they changed it back to 3 quarts. Since I went Saturday, I only got 2 quarts. I also watched on farm pick up members get strawberries as part of their Week 3 (my Week 2) box, yet we didn't get any. Do you see how this is annoying? I would love this CSA if not for all this nonsense. I don't know if Honey Brook will ever read any of this, but I hope that they understand running a service like this requires someone running the program that understands the basic idea that all your customers want to feel equal. I'll keep their grade at a reluctant B-.